Notice that in each case, you can recognize the product of functions because the variable x appears more than once in the function. Whenever you’re faced with integrating the product of functions, consider variable substitution before you think about integration by parts. For example, x cos (x2) is a job for variable substitution, not integration by parts. When you decide to use integration by parts, your next question is how to split up the function and assign the variables u and dv. Fortunately, a helpful mnemonic exists to make this decision: Lovely Integrals Are Terrific, which stands for Logarithmic, Inverse trig, Algebraic, Trig. (If you prefer, you can also use the mnemonic Lousy Integrals Are Terrible.) Always choose the first function in this list as the factor to set equal to u, and then set the rest of the product (including dx) equal to dv. 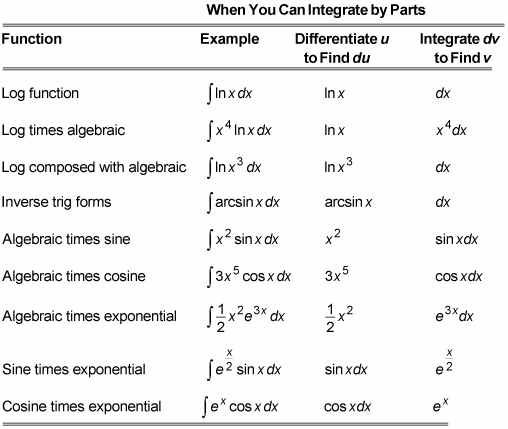 You can use integration by parts to integrate any of the functions listed in the table. When you’re integrating by parts, here’s the most basic rule when deciding which term to integrate and which to differentiate: If you only know how to integrate only one of the two, that’s the one you integrate!